Mr. Gomberg is a talented litigator whose clients seek out his services in assorted fields of law. Mr. Gomberg's areas of legal practice span civil and criminal matters in both State and Federal court. His attentive, result-oriented approach has led his clients to often return to Mr. Gomberg for assistance with other personal legal matters. Whether explaining complex legal matters to lay persons, negotiating settlements, or conducting a trial, Mr. Gomberg's consistency and tact help produce the results that have led to the expansion of his law practice. 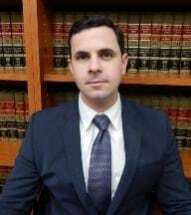 Mr. Gomberg is a graduate of the New Lawyers Institute and a member of the New York State Bar association.